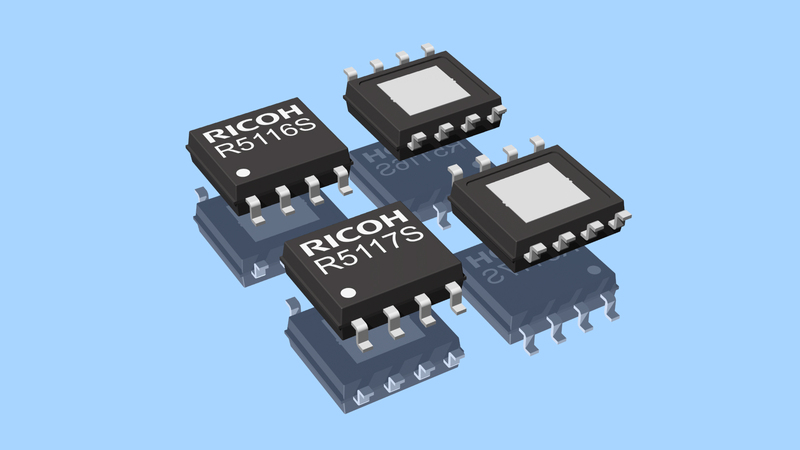 Ricoh Electronic Devices Co., Ltd. in Japan has launched the R5116 and R5117, a 500mA voltage regulator with either a window or a battery voltage detector and capable of operating in a wide input voltage range. These products were especially designed to add functional safety to automotive, industrial, and consumer applications, requiring a high level of operational reliability. Microcontroller processors often require a precise power supply in order to operate properly. To improve the reliability of the application some additional monitoring circuits have been added to check if the power supply operates within the narrow safety margins. If the supply voltage exceeds the safety margins, the microcontroller must be reset to prevent its operation from working improperly. The R5116 and R5117 both have a 500mA voltage regulator and supervisory circuits embedded in a single package which saves valuable circuit board space and additional wiring between the components, providing the designer a cost effective solution with minimal external components. The integrated supervisory circuitry provides an active low reset signal when the regulator output falls out of regulation or when the input voltage falls below a minimum. As for the circuit monitoring the output voltage, it has an independent sense pin which can be connected to the regulator output or directly to the microcontroller supply voltage pin for improving the measurement accuracy. The new CMOS-based R5116 and R5117 are robust enough to survive in harsh conditions; operating up to 42 V and even tolerates load dump surge peak voltages of 60 V with a duration of less than 200 ms. The minimum operating voltage starts at 3.5 V, which makes the products suitable to use even at severe cranking conditions. The product will be available in a version intended for the consumer, industrial and automotive application market and has customized operating temperature ranges, respectively -40 to 105°C, -50 to 125°C and -40 to 125°C. The automotive version is scheduled to become AEC-Q100 compliant soon. All settings for the output voltage and supervisory thresholds are internally fixed by laser trimming and have a high accuracy level, making the product suitable as a power source with high reliability. The voltage regulator has an excellent transient response, a change on the input or load results in only a small signature on the output voltage and a false supervisory detection is prevented by these characteristics. The ripple rejection ratio is in the range of 70dB at 1kHz. Another important feature is to minimize current consumption for those applications that are continuously active, thereby extending the operational lifetime of the battery. The R5116 / R5117 contribute to reducing the total current consumption with respectively Typ. 25 / 35 µA in On-mode and 1.5 / 10 µA in Off-mode by controlling the chip disable pin. The outputs have an N-Channel open drain and require an external pull-up resistor to define its logic high state, each supervisory circuit has its own output and can be combined together or connected individually to the microcontroller. An external capacitor is used to specify the active reset period and power on reset time, it should be set long enough in order to reset the processor properly. The R5116 and R5117 have an array of safety features, protecting the voltage regulator and other parts of the application from possible damage and defects. Over-current protection, reducing the output current when overloaded. 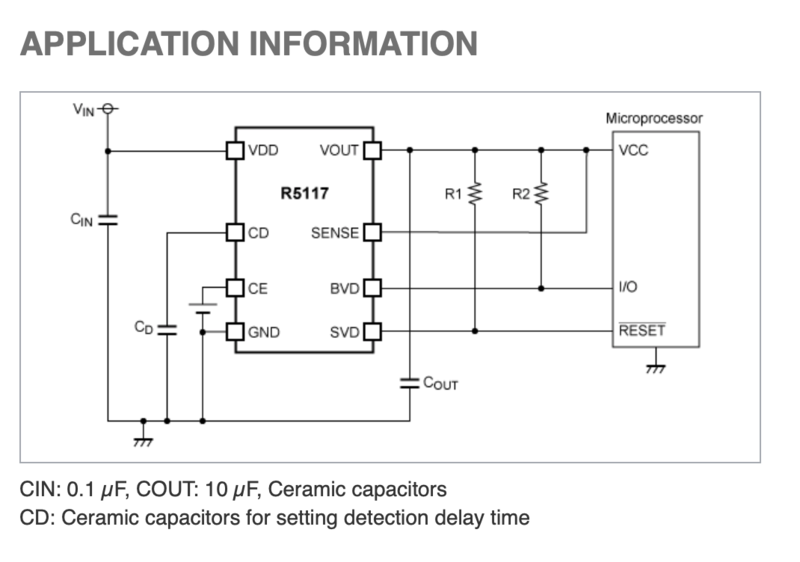 Short protection, an embedded fold-back short current limit circuit detects a short circuit and decreases the output current to a safe level of 105 mA, after removing the short the regulator resumes to normal operation automatically. Thermal protection is incorporated and will turn off the regulator when an over-temperature of 175°C is detected and will resume to normal operation again as soon a temperature of 145°C is reached. Target applications for these products are for example devices with a direct 12 V battery connection, ECUs, Infotainment, Security System, Dashboard Systems, Remote Keyless Entry, Immobilizer, Gateway and ADAS Drive Safety Systems. Want to find out more? Contact us to see how our range of Ricoh products can improve your technology solution.